Ocean layers between 200 and 1000 meter depth harbour large numbers of animals. There is zooplankton and small fishes living from the photosynthetic plankton from the top marine layers. These organisms constitute the food basis for larger predators and have a huge combined biomass. 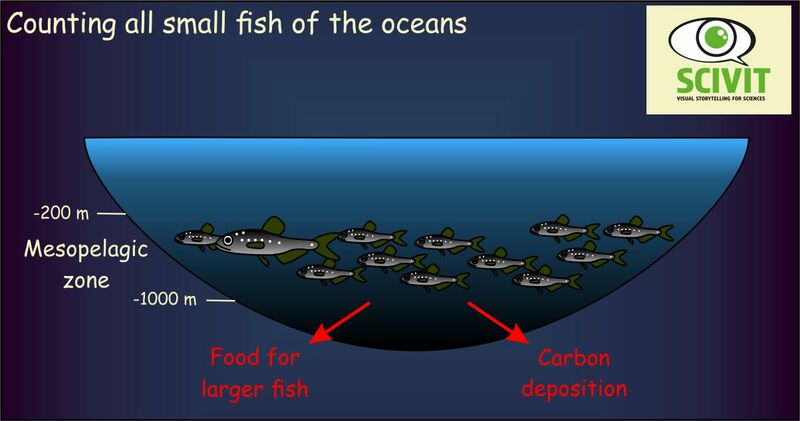 They are also important in promoting the carbon sink character of oceans. How to study marine life below 200 meters? In contrast to the upper layers, marine life below 200 meters cannot be studied by satellite data. So how do we know about it? The mesopelagic zone was discovered using the sonar technology from world war II. Proud and colleagues established a global database of sonar data delimiting the mesopelagic zone. From these data they were able to establish various mesopelagic classes, to identify factors driving mesopelagic biomass and to predict future development. According to their analysis rising marine temperatures will increase global biomass in the mesopelagic zone while particularly productive zones will shift towards the poles.